Friday, October 26: As we walk down the gravelly and dusty hill from the tukul village to Bet Giyorgis, the gravel slips out from under my feet and I crash to the ground, my right knee collapsing under me like a jackknife. I can’t even stop the barrage of unladylike words that spring out of my mouth. Three years ago, I had a partial knee replacement in my right knee, and it seems whenever I fall, that’s the knee that snaps. When I fall today, it hurts like hell! I think for sure I have seriously damaged it. Masala and Ed lend me their hands and pull me up. After dusting myself off and shaking it out, I find my limbs appear to be intact. I’m in pain, but I think I’m okay. Thank goodness for that. 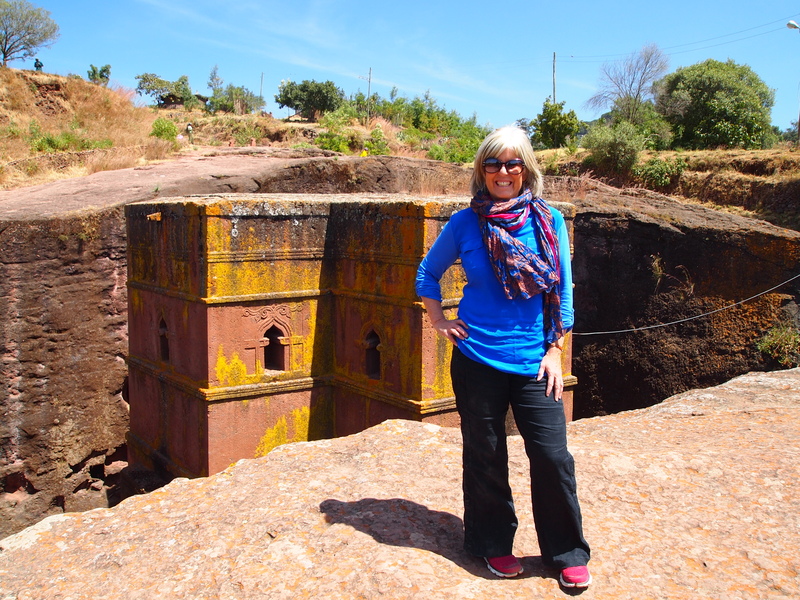 Ethiopia, and especially Lalibela, is not a place where I would want to have a medical emergency! 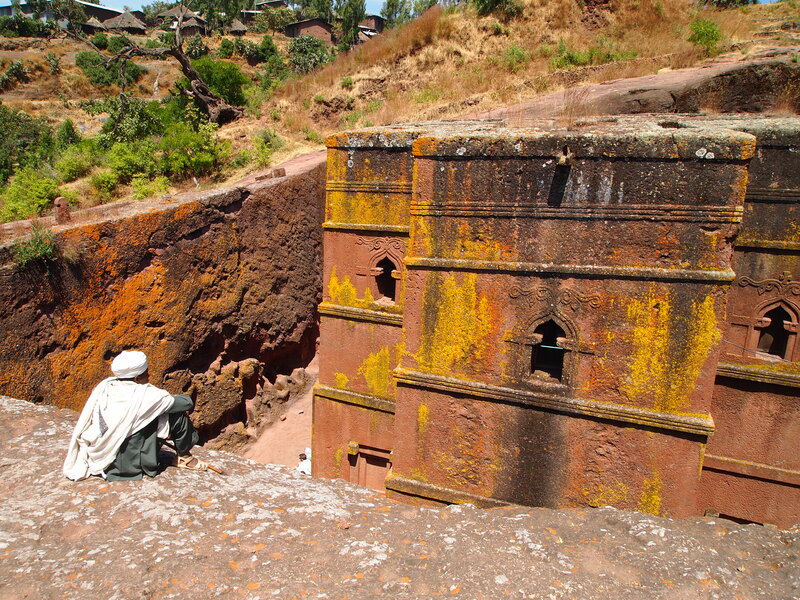 We continue down the hill to Bet Giyorgis, the most spectacular of all the Lalibela churches. For one, it is perfectly formed in the shape of a Greek cross. 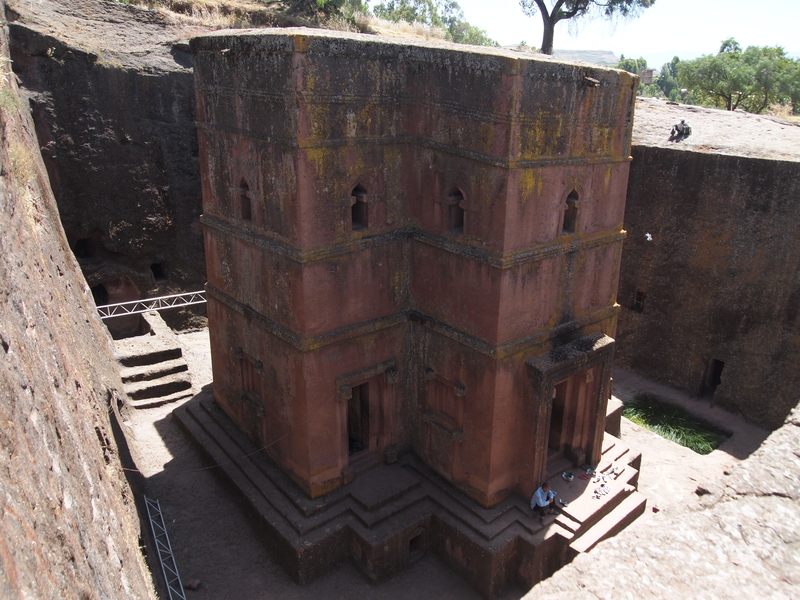 It is 15 meters (49 feet) high, carved out of a deep trench, and is the best preserved of the churches. Because it is well-preserved, it lacks the obtrusive and unsightly UNESCO roof and scaffolding that most of the other churches have. 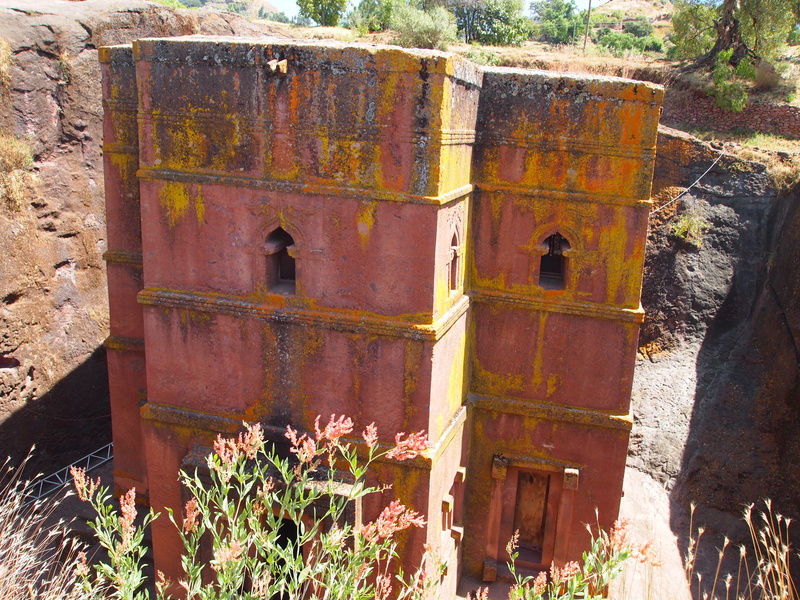 Carved from solid red volcanic rock in the 12th century, it is the most well-known and last built of the eleven churches in the Lalibela area. 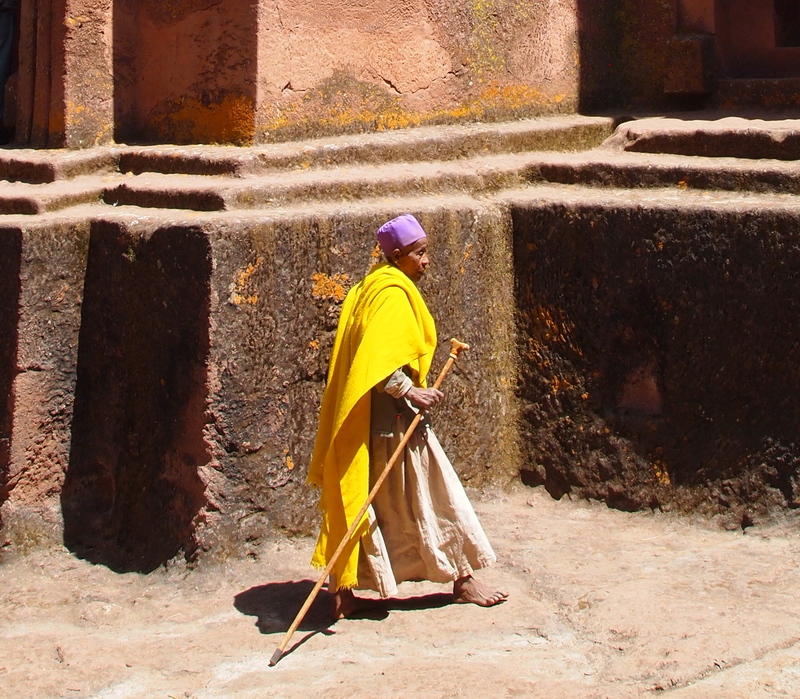 Legend has it that Ethiopia’s patron saint, Saint George, unexpectedly came to visit King Lalibela on a white horse, just as the King was finishing off his churches. St. George was a little peeved as none of the churches was dedicated to him. 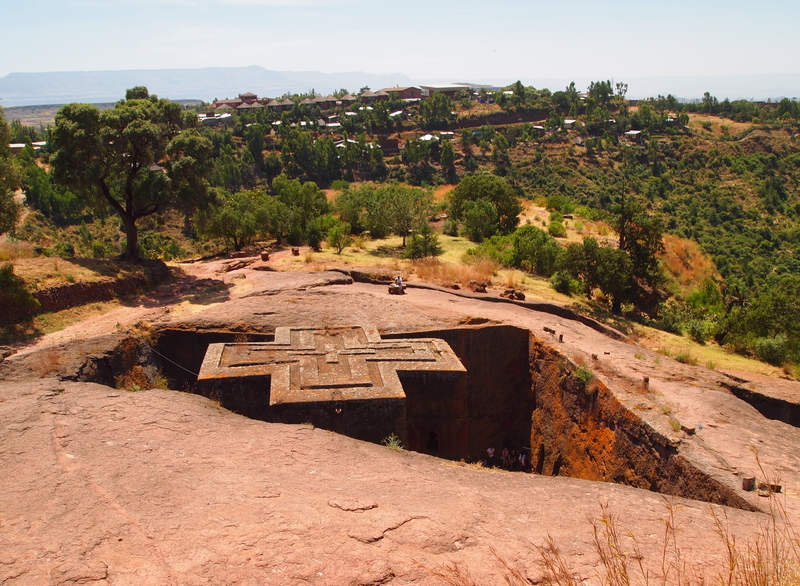 King Lalibela immediately sought to make amends by building St. George the most beautiful church of all, Bet Giyorgis, which means Church of Saint George. The dimensions of the trench within which the church sits are 25 meters by 25 meters by 30 meters (82’x82’x98′). 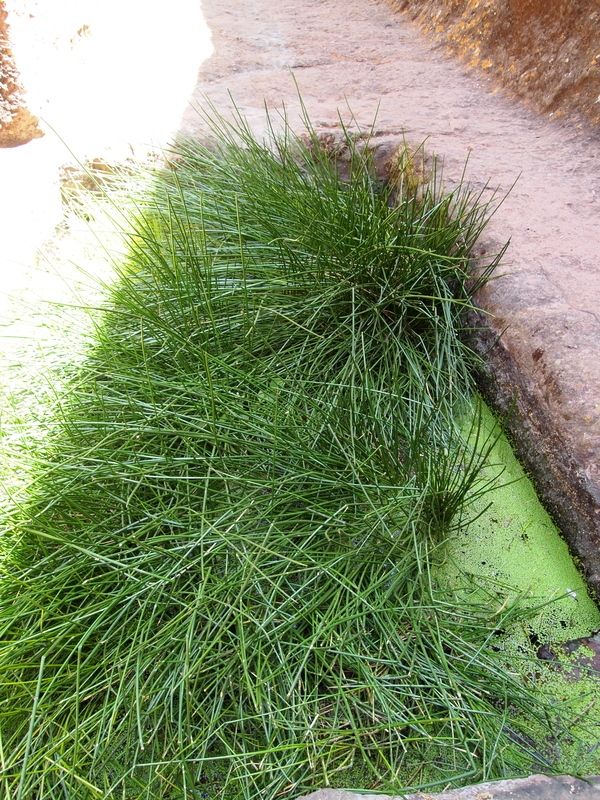 Outside the church is a small baptismal pool, overgrown with grasses which are used in Palm Sunday services. 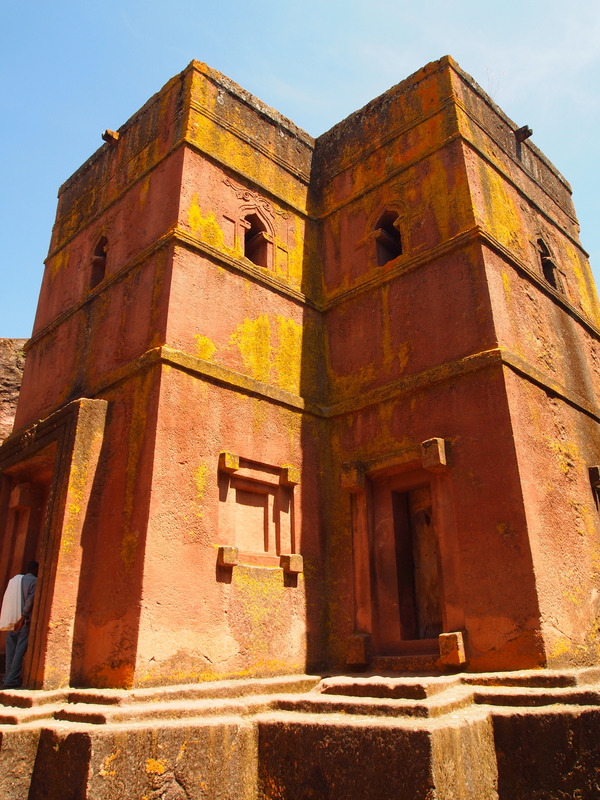 Inside are more colorful paintings, a priest, and two 800-year-old olive-wood boxes: one is rumored to have been carved by King Lalibela himself and is said to contain a crucifix, made with gold brought from King Solomon’s Temple in Jerusalem. Masala tells me I can ask the priest to wave his cross over me for healing, following my fall as I came down the hill. I ask him to do so, and he waves the cross all around my knees, and then all over my body for healing. Ed has him wave the cross over him too, for general back pain. We tip him several Ethiopian birr. 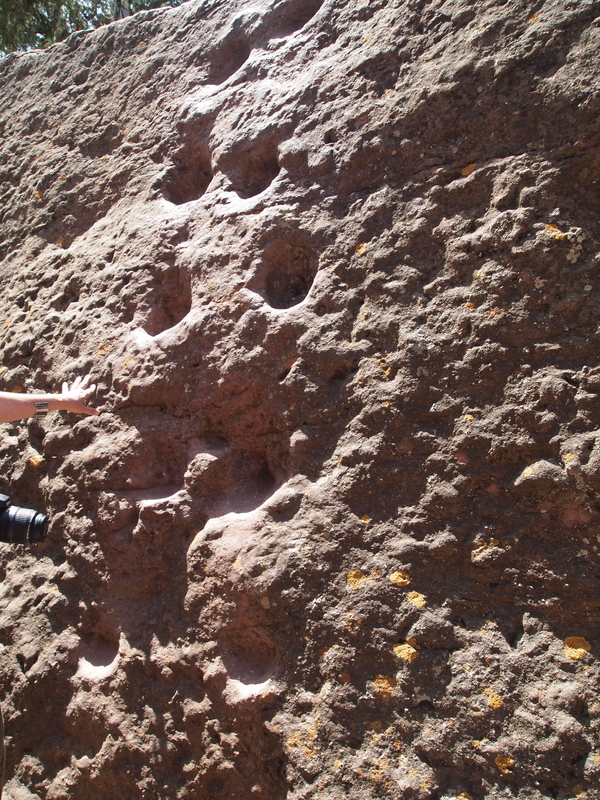 As we leave the church, we see the hoofprints left by St. George’s horse, permanently gouged into the stone on the sides of the trench. After we visit Bet Giyorgis, we head back to our hotel for lunch. Later this afternoon, we will head to the southeastern group of churches. I never cease to be amazed at these creations! What a treat to be able to visit them in person. I hope your knee is nice to you. I saw a picture of this place a while back and have been curious about it ever since. It looks amazing! 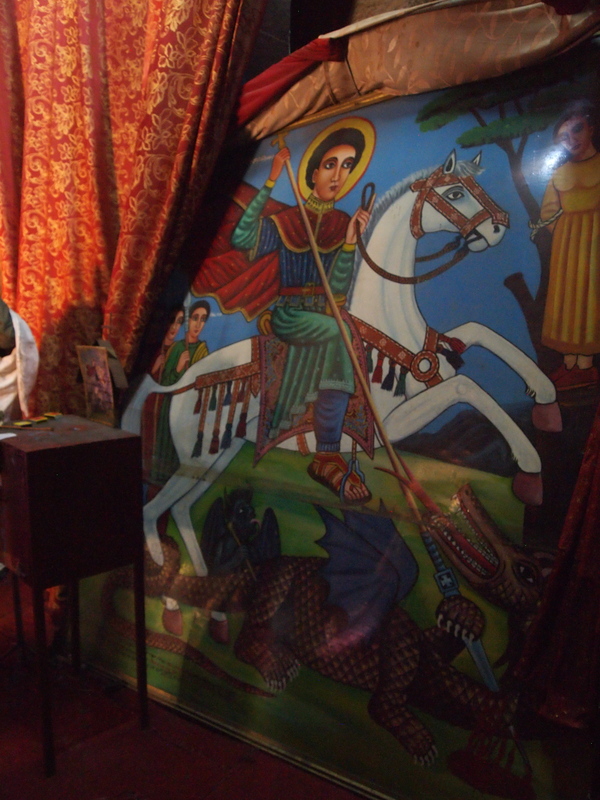 There are so many great legends in Ethiopian culture! And I love those paintings!